Does a song as down to earth, with two feet dug deep into Sealand's clay, as 'Gloria' is, translate into anything else? As of today I can say yes. Not just a simple yes, but with my whole heart and soul. In the summer we reviewed 'Gloria' the beautiful, extremely down to earth, album by Broeder Dieleman. Since Broeder Dieleman toured with Will Oldham, better known as Bonnie 'Prince' Billie, who is no stranger to this blog and before that the Magazine version, either. The two mainly performed in churches so I understand. Was this one one of them? For Record Store Day, 18 April, both release a 7" split single called 'Three Glorias'. Hearing is believing what the two can do with each other's song. Broeder Dieleman covers 'Three questions' from 'Master and everyone' and Bonnie 'Prince' Billy covers the title song from Dieleman's last album. Both master the other's song in the most elementary, but so intensely beautiful way. Bonnie 'Prince' Billy just plays an acoustic guitar and fills the space with his typical voice. Spare guitar notes and simple sounding chords is all he needs to make 'Gloria' come alive totally. The only frivolity being an also typical female voice accompanying him in the chorus. Minimal effects create a great atmosphere. Every second of the song is right and totally vulnerable. Touch it and it will break. Music and singing without any layer of defence left, bare right to the core. 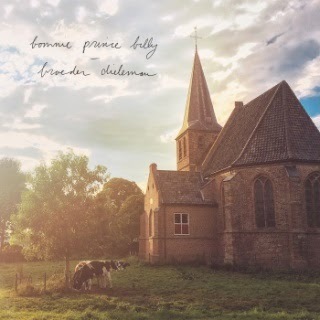 Broeder Dieleman easily draws Bonnie 'Prince' Billy's song into his own world. Again with minimal effects, a little more than on Oldham's take on 'Gloria', but in the end all is acoustic. Dieleman creates the same sort of magic in this song, totally in line with the sound on his last album. The spare piano notes do all they have to do, colour the song, providing it an endless seeming depth to fall into forever. The two triumphed last year, simply because Tonnie Dieleman approached Will Oldham and asked him if he wanted to tour with him. A tour I unfortunately missed. The next question seems as easy as it's bold: "Will/Tonnie, would you like to record a record with me"? Hearing what I'm hearing, it's inevitable that the two release a record one day. In word, play and atmosphere they seem to be made for each other. Sealand clay and Kentucky coal. Something solid and everlasting was made from that combination. There's only one thing left to comment: What a beautiful cover. London based photographer Simona dalla Valle (@SimoValley), captured a small piece of The Netherlands. It's the chapel at Persingen. The cover captures the atmosphere of the music presented not only in a lively way but showing the church in a timeless kind of way as well. A huge underscore to all the pastoral quality present in both Broeder Dieleman's as Will Oldham's music. And thus Della Valle made both his art as the music eternal. Like the music, the photo could have been made 100 years ago or longer. What a present is presented this Saturday on Record Store Day. You better be there to check it out (and all the other goodies of course) in time at your local record store. We received this response from Broeder Dieleman on Twitter: "dankje, en dank voor de woorden. ".